I felt very proud and accomplished when Noloan came into this world. 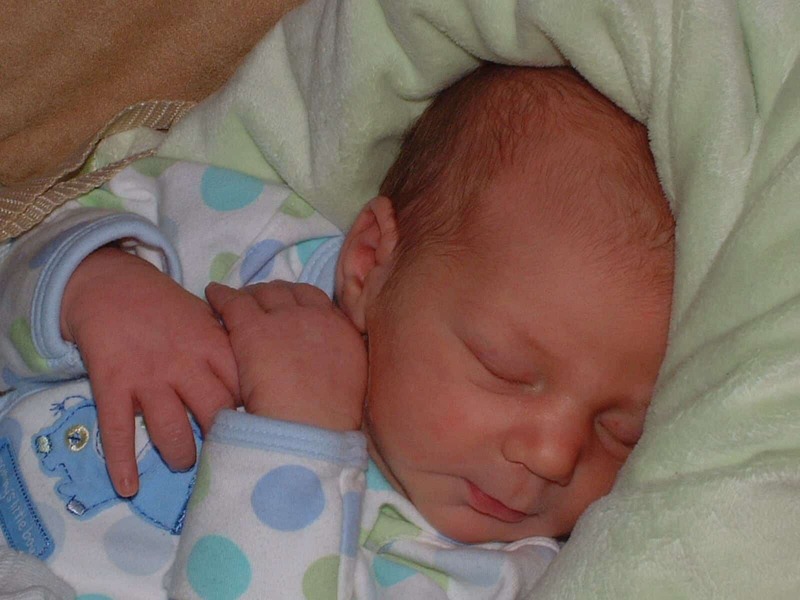 Thanks to Amanda from the Hypnobabies Yahoo Group for sharing her birth story with us. During my 39th week of pregnancy, I began having rhythmic Braxton hicks. I started eating pineapple, spicy foods, walking, pregnancy tea (with red raspberry leaves), and taking evening primrose oil to induce labor. Since July, I’ve practiced Hypnobabies hypnosis to prepare for Nolan’s birthing day. At 12:20am on Saturday, October 22 (my edd) I began having mild, real pressure waves. I had about 2-3 per hour, but nothing rhythmic. At 11am I had my bloody show. I went about my daily chores, enjoyed time with my husband and went on a late night walk. I didn’t realize how soon my life would change as I kissed my husband goodnight shortly after midnight on the morning of the 23rd. I woke up at 2am to pressure waves that I had to breathe my anesthesia to manage, but tried to go back to sleep. At 3:30am I started timing the pressure waves and they varied in length from 4 to 7 minutes apart. At this point I could no longer sleep, I could only focus on getting through each pressure wave. My husband awoke at 4am to my loud breathing. We laid in bed timing pressure waves wondering if this was it. At 5 am I moved from the bed to the couch. My husband made coffee; I ate a banana as I contemplated calling the midwife. At 5:30am I called the midwife, I told her my pressure waves were 4-7 minutes apart. My midwife was at the hospital assisting another woman push, she seemed distracted while on the phone with me. After listening to a pressure wave of mine, she thought I should get in the tub and relax until my pressure waves became more regular. My midwife thought I was in early, not active labor. My husband decided it was time to gather last minute odds and ends for the hospital bag. Shortly after the call, my pressure waves came 1-2 minutes apart. I felt pressure waves come on top of one another not offering any relief. I started loudly vocalizing during the pressure waves. At 6am I had my husband call the midwife back and let her know how soon my pressure waves were apart. She decided it was time to head to the hospital. My husband finished packing and I decided to go the bathroom before the 45 minute ride to New Orleans. I had my second bloody show. I wondered if I was in transition and started feeling pushing sensations. My husband attempted to put my shoes on my feet, but my pressure waves were so intense I couldn’t focus long enough to put them on, so I left the house with just my socks. I hopped into the car and I had a hard time getting comfortable. I could only lean on my left side, any pressure on my bottom was too intense to handle. The trip to the hospital felt like it was out of a movie; my husband drove 95mph on the interstate. Once in the city, he ran several red lights to expedite the trip. My pressure waves eased up on during the ride, I thought my labor was stalling. We arrived at the hospital at 6:45am. My husband parked in the parking garage with his hazard lights on and assisted me to the labor ward. On the way to the unit, I had to stop several times in the hallway, lean up against a wall, and breathe through pressure waves. Hospital staff offered to get me a wheelchair, I tried to sit in the chair, but the pressure on my bottom was too great. I got checked in and walked myself to the labor room. I changed into a gown and received my first cervical check. I was told I was fully dilated and ready to push! I couldn’t believe what the nurse said; I had her repeat herself thinking I was only 4cm or so. I wanted a water birth, I even had a birth tub rented, but I was so far along I didn’t have time to use the tub. I ended up pushing in a position with my back reclined and my knees bent. It took me a while to feel comfortable pushing. I ignored the feeling for so long, it took some time for my body to release into the sensation. My midwife offered me perineum support as the head was crowning. At 9:48am, Nolan Blaze entered the world crying and flailing. Nolan was placed on my chest and his cord was cut by my husband immediately afterward. Whenever I visualized the birth I imagined I would cry when I first saw Nolan, however, I had a different response. I felt very proud and accomplished when he came into this world. I was brought a roasted chicken lunch and slowly ate as my family held Nolan. In the middle of eating, I was moved to a recovery room where I finished my lunch and began breastfeeding. Nolan latched well and ate for 25 minutes during my first attempt. The rest of the day was spent holding and feeding Nolan. The next morning my midwife who delivered Nolan called and asked how I was doing. She let me know she was really impressed with how I handled the situation and that I had the type of birth most of her clients desired and wanted to know my secret. I let her know that the hypnosis relaxation techniques helped me cope with the discomfort. She informed me that the other midwife would stop by and if I looked good, I could go home! The baby and I were checked out and we only had to spend one night in the hospital. What worked most for me were the relaxation techniques, positive thoughts, and breathing my anesthesia to where I needed it most. I highly recommend the Hypnobabies program.